Be the traditional yet contemporary in this Off White Brocade Sherwani. All patterns are intricately embellished with Crystals & Stones, Resham & Velvet Patch work. 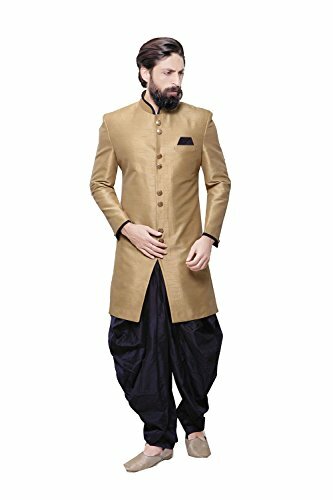 Additional Information : - Mojris, Stoles, Turban & Other Accessories Are Not Sold Along With The Mens Wear.As This Sherwani/Waiste Coat/Kurta Are Made As Per Orders So It Is Strictly Not Acceptable Once Get Delivered .So Kindly Choose Body Fit Size . Also We Keep 2 Inches Extra Margin In The Dress.